As a preface, I'm really wanting spring to hurry up and get here...and you can really tell that's the theme going on in our apartment right now. It's looking really floral and really girlie, which is not it's usual style. Our coffee table is LONG and I wanted a way to break it up and make it not look so sparse. I hit up a couple of local thrift stores and found these gorgeous gold mirrors for $1. I knew I wanted to use them for something, and thought they were the perfect way to break up the table a bit. Maybe he is right, I can't believe I have the same fabric in two different colors! Time to seriously lay off the geometric fabrics for a while. Anyway, I could spend hours in second hand shops... and most of these items came from a new one I just found. Anyone hunting at their local thrift stores lately? I LOVE the lamp! What type of paint did you use? I am looking for a turquoise lamp but am not about to drop 300+ on the one I found! It's those little projects that you get to check off that make you feel good, though! 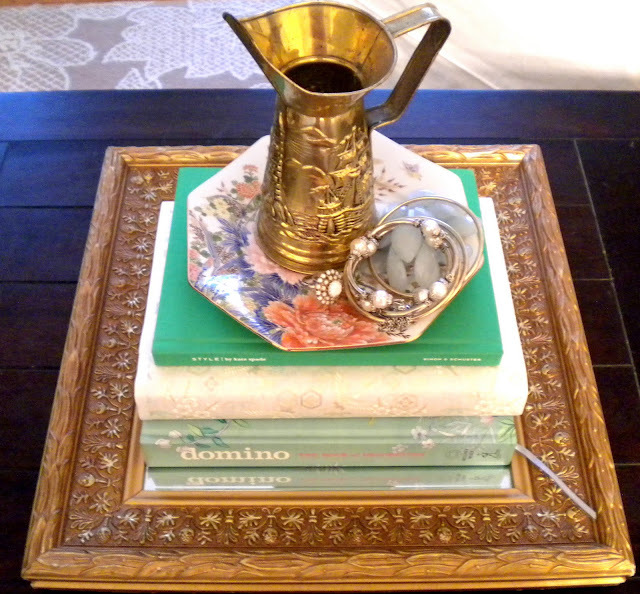 I really like how you prettied up the coffee table and that lamp looks great! I made a craigslist find the other day (just posted about it last night), but haven't been to our thrifys yet this month. Now I have that itch!! The idea with the two mirrors placed on the long coffee table is brilliant. Their beautiful frames add structure to everything that is placed on top. Love it! Love the pillow and adore that lamp. you are so cute with your projects around the house!! 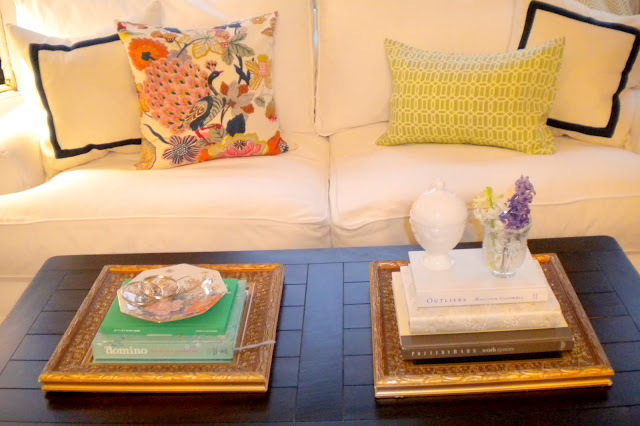 I love how your couch looks and the coffee table with the new frames are super cute! I love the milk glass! A great find. I like how you broke up the table. It looks great. I love the little glass vase, so pretty and perfect. This is adorable! I adore your pillows. Where did you get the floral one? Great bargains - well done. I love the jug the most. Congratulations on a great paint job on the lamp too. Looks good! So impressive - nice hunting! We have no good thrift stores here in JH, so I must live through your shopping! I love the lamp - I think the powder blue is lovely and probably looks great on your fab desk! love love love! How did you make the pillow with heat bond?! This revelation is news to me as well. looks great. very creative. love the pillow and lamp too. I'm so impressed. Great finds. I am going to have to find a lamp somewhere and get to painting! You got yourself some good finds - definitely brought some spring into the living room. It's funny I never went into a thrift store before I started reading blogs and hearing about the amazing things people found. Now I too love to go and hunt down cute plates or tablecloths - those are my favourite finds. I love your milk glass. I need to find some. Officially, this is the cutest project and you did a fabulous job! I love the mirrors and the little touches. It all just came together. So sorry I missed last night! I have been so busy I could cry. I hope that next time I can be there! I love everything! I too have a thing for geometric prints! I'm at the thrift store almost everyday and almost always find something good! I love the lamp in light blue, and LOVE the fabrics too! Great finds! I like how you used the mirrors. I have very similar ones that I've used to display candles on but I like the book idea. I'm also on the way to get some Heat-n-Bond! How have I missed this? Is it easy to use? Would love to know more. I have one of those exact framed mirrors. I painted mine ivory. I lay some of my jewelry on it, on a dresser in the closet. 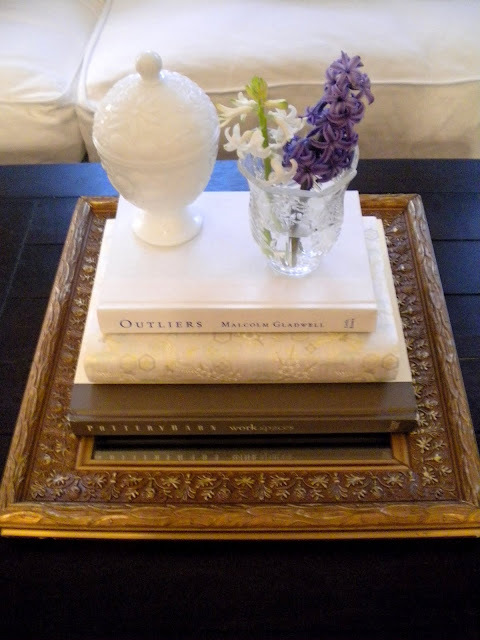 The two really work on your coffee table! Love what you've done. Especially the blue lamp! I have a lamp project underway myself. I want to do a chevron pattern but am still a tad too intimidated as to how to execute that one... love your pillows, also! You found those mirrors for $1 each? Thats a steal! I feel the same way about geometric patterns...so fun! and that lamp looks great! keep it blue. now invite me over so I can piece it all together for my mental picture of your apt. What a great pillow project... i love your vignette! i love your fabric and am totally stealing your pillow project! i scored some amazing cane back folding chairs for 2.50 each, i'm going to reupholster the fabric and can't wait to use them for some extra table seating! my dad says i have an obsession with chairs..i dunno. Love your pillow project & your lamp! I love thrift shopping but it's easy to become addicted to it with all of the great deals! I need to photograph some of my latest finds, yours are great! Just bought a chair (tomorrow's post) and I'm looking for fabric--where is the 2nd one from?